The ESRD continues to put forth that your wild horses are not native to Alberta and are an exotic species, feral and invasive animals, completely ignoring science and Alberta’s history. It is interesting then that on an Alberta Government heritage site they take a different view. I have attached the following link so that you can follow the repatriation of the horse to Alberta. One important point is in the second paragraph where they state, “When horses galloped across what would become the US border onto Alberta’s rolling prairies in the 1720s, it was a bit of an overdue homecoming. Also, here is a letter by Dr. Claudia Notzke in regards to our wild horses being native and not invasive to our Alberta landscape and the current controversy surrounding this whole issue of a capture season this year. The hunt is on again for Alberta’s wild horses. Horses will die, and people protest. In these fast changing times this crude ritual seems to repeat itself not only year after year, but decade after decade. And the same old myths are espoused over and over and over again. I have talked and written about the following statements many times in the past, but there are a few additions, and with the onset of the Chinese lunar calendar’s Year of the Horse I feel an urge to raise my voice as one of many Albertans once again. Listening to our provincial government charged with the stewardship of our natural resources, we hear about an exotic introduced animal wreaking havoc on the native ecosystem, competing with native wildlife and resource industries, and reproducing out of control, with no predators to keep them in check. Speaking in evolutionary terms, the horse is America’s gift to the world. Equus caballus originated in North America and co-evolved with its habitat. In natural history terms, wild horses returned to their evolutionary home after but a brief absence. Alberta’s wild horses (not withstanding their domestic ancestors many horse generations ago – not 100 years but at least 260 years ago) are genetically equivalent to the last wild horses to have roamed western North America during the Pleistocene (the last ice age). This is not a matter of opinion but a scientific fact. Not only are they native, but they are also wild, having fully regained (or never lost) their complex social behaviour and having developed symbiotic relationships with their fellow species, predator and prey animals alike. What our wild horses are today is a product of natural selection, not domestic breeding. Far from being unaffected by predators, they are unique amongst wild horse populations in the world in having to contend with a full suite of large predators, wolves among them – another misunderstood wild animal, reviled and persecuted. All this is old news. But there is a new myth: the current capture season is a result of a unanimous recommendation by the Feral Horses Advisory Committee, which is purported to fairly represent relevant stakeholders with a legitimate interest in the horses’ situation. Yes, there is such a committee. However, the recommendation was not unanimous. This committee is stacked with a heavy preponderance of “productive” interests (i.e. forestry and cattle grazing as well as sport hunting) and their support agencies. Not only that, but those stakeholders who openly advocate for a removal of horses in order to financially benefit from the capture and sale (frequently for slaughter) of a publicly owned resource, as well as stakeholders who openly push for eradication of wild horses from the ecosystem in order to satisfy sport hunting interests, are represented by more than one individual contravening the committee’s original intent of one representative per stakeholder. The Wild Horses of Alberta Society (WHOAS) is the only stakeholder representing the interest of Alberta’s wild horses as well as that of an amalgam of people who have an interest other than that which can be measured in dollars and cents. WHOAS is also the only stakeholder pushing for independent peer-reviewed scholarly research into wild horses’ population ecology and the wild horses’ role in the current ecosystem. A large number of stakeholders remains unrepresented and their voices unheard: a rapidly increasing number of photographers and artists whose vocation is inspired and nurtured by wild horses (this can be measured in $! ); the many recreationists whose overall experience is enriched by an encounter with wild horses; the large number of tourists -domestic and international- who come to pay homage to this symbol of freedom and western heritage; and the countless Albertans and Canadians who may never see a wild horse and yet are inspired by the very existence of wild horses leading self-determined lives. If these animals need to be “managed” there are more humane, sophisticated, civilized, and scientifically grounded methods to accomplish this than what is currently happening: selective capture and relocation or fertility control by PZP (porcine zona pellucida) immunocontraceptive vaccine. It is high time for Alberta to catch up to the 21st century! As stated all of the alleged stakeholders on this committee, except for WHOAS, wanted a capture season, including the RCMP. I find this disturbing because of the history the wild horses had in helping the NWMP in peacefully settling Alberta. WHOAS attended these meetings with high hopes that a sound management strategy would be put forth based on science. We became quickly disillusioned. This response is typical of the overwhelming comments from the vast majority of Albertans who believe that your wild horses have a right to be respected and preserved. The terminology (“feral”) used by the ESRD and opponents to these horses will never allow this to happen. Keep up pressure to the government via the petitions, letter writing, emails and phone calls. 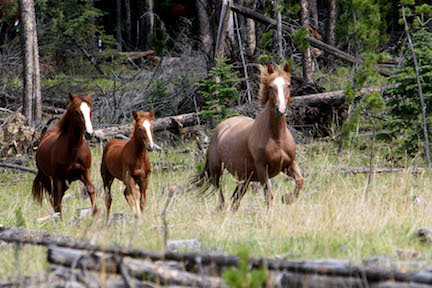 Your wild horses need your help. Absolutely brilliant! So glad you found this, I’ve been telling anyone who will listen these horses have been here for nearly 3 centuries – how can they possibly be labeled invasive or feral? Hello there, I am the owner of a beautiful Wildy named Lucky that we rescued as a baby almost 4 years ago. If you search Lucky on this site you will see her rescue story and pictures. Lucky is growing into a beautiful horse and is showing signs of mustang blood. I wonder if Lucky and other rescues could aid in this dispute over feral versus wild? If she and others like her were tested (only if not invasive, i believe blood testing is all that needs to happen?) and we could prove that there is mustang blood running free out west, would this aid in the battle? I know myself, Tim and Lucky would be more than happy to help out if it meant saving her relatives. Final note, thank God people are more aware this year and there is such a great start to a movement that may make a much needed and long awaited change. This is only the beginning and this momentum and public involvement must continue and grow. Is there an Alberta wild horse association; like quarter horse assoc. Is there a way of captured horses being taken from the captures or bought from them and resold to trainers or people interested in taming them or just keeping them and have a private horse sale for the tamed and broken ones and others being released back to the wild. This capturing has to stop, I have contacted the government as well. I did not connect my self to you people but as an concerned citizen. I did not get a reply.